After I explored to the east of Seoul, in the Chuncheon and Gapyeong area, I returned to the city for the next two nights of my trip. There's so much to see and do in a city the size of Seoul, and I only had a day and a half, so I had planned in advance and decided to focus on just one area this time round, and tick off several of the most popular tourist sights. I had booked a hotel in the Myeong-dong area, on the north side of the river, and pretty central to everything I was going to see. On my first night there, after returning from Chuncheon, I more or less went straight to bed, since all my activities were great, but did leave me pretty tired! I was up early the next day though to start exploring the Korean capital. I hit the ground running with probably the most popular and well-known sight, Gyeongbokgung, one of the five major palaces in Seoul. This was the first palace built by the Joseon Dynasty, and the largest, and served as the seat of power in Korea. The first thing that impressed me about it, was the fact that you can see mountains beyond the palace, which creates a spectacular backdrop, but then if you were to view it from the other direction (as you can once you're inside the ground), the modern skyscrapers of Seoul surround it on the other side, creating this amazing old meets new scene. The next thing I noticed was the huge numbers of people wearing hanboks, traditional Korean dress, in a whole rainbow of different colours and designs, each one unique. There were even more wearing them around the rest of the city, because it was the Chuseok holiday and it's traditional, but they also benefit from free entry to the palaces when wearing one. Inside the palace, everything is designed with precisions and symmetry, as you wander through courtyards and the numerous buildings that make up the complex. I did find many of the interiors to be quite plain, even the throne room, but that's probably coming form a European perspective on palaces . The buildings were beautifully constructed though, with all the intricate, colourful detailing on the outside, and often on the ceilings, and many pillars and archways. The guide maps available tell you which areas were used for what purpose, and you can get guided tours if you want to know even more details. I particularly liked the two pavilions, both located on the water, as they sit so prettily amongst the natural scenery. The Geoncheong complex, right at the back, was also interesting as the architectural design is simpler, with wood finishes on everything, instead of coloured designs, so it stood out as a little more memorable to me, compared to the rest of the palace. My second spot of the day was not one that I had initially planned on, but after seeing an exhibition advertised online, I thought I'd take a look, especially as it was in the same area as the palaces. I went to the ARA Modern Art Museum, which was hosting an exhibit by Mr Brainstorm. Modern art is very hit or miss for me, as I think some of it can be so clever and creative, and some of it is just weird or stupid; art is subjective guys (I wrote a whole piece about my thoughts a few years ago)! Anyway, Mr Brainwash has worked with Banksy in the past, and does his own kind of street art, and from the photos I'd seen online, I thought it looked pretty cool. Some pieces I understood more so than others (it helped that some had comments by the artist next to them, to explain), but it was all very interesting in one way or another. I liked the portraits of musicians created from vinyl records, the different interpretations of pop culture icons, and the old-fashioned paintings with modern features (even Star Wars) added in. One room has been turned into a sort of replica of what Mr Brainstorm's studio is like, with paint splattered everywhere, and chaotic piles of objects scattered around. 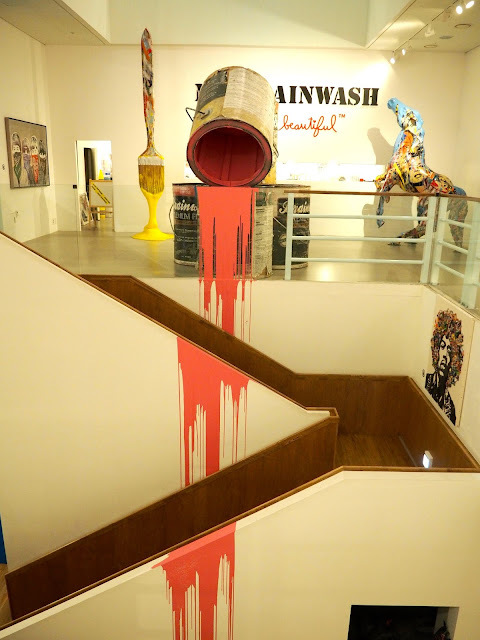 It was cool to see an exhibition installed in a museum like that, as some pieces had been created to work with the building, such as the giant overturned paint can dripping down the stairwell, which can only be achieved in an exhibition like this. After the museum, I realised I still had loads of time - initially my priority was to see Gyeongbokgung because it's the main palace, but since I had extra time, I decided to check out Changdeokgung too, since it was close by and the pictures I'd seen looked nice. There was no way I was going to all five palaces, as while I'm sure they're all beautiful, I think they'd have started to look the same after a while, and I'd have gotten fed up. I walked there through the Insa-dong distraict of the city, not taking any specific route, but just picking streets that looked interesting, and I stumbled across the wide street (no idea what it's called!) full of shops selling tourist souvenirs and traditional-style Korean goods. I didn't want to weigh myself down with purchases though, and I've got a whole year, but it was nice to window shop and think about what I might like to get, for myself and for others. Anyway, my meanderings eventually got me to the gates of Changdeokgung, the second of the palaces to be built, and a favourite of the Joseon kings because of its gardens. The Secret Garden, behind the complex, is one of the main reasons to visit this palace, and is supposed to be very beautiful, and was left largely natural instead of being cultivated extensively. However I skipped this one, because you can only do it on the guided tour, and I'd have had to wait n hour for the tour, and then it lasts 90 minutes, which added up to too long for me. This palace is smaller than Gyeongbokgung, so it didn't take as long to walk through the buildings; in some ways they were pretty similar to the first, and I found it interesting that the main buildings were colourfully decorated, while a smaller side complex was finished in wood, similar to in Gyeongbokgung. The palace was designed and built to fit in with its natural surroundings, with the nearby mountains and the garden at the back. Anyway, now I feel like I've thoroughly seen Korean-style royal palaces! My last stop of the afternoon was a couple of subway stops from the palaces, back towards the area my hotel was in. The Namsangol Hanok Village is located at the bottom of Mt. Namsan, right in the middle of Seoul. It's funny to come out the subway into the middle of a big, busy city street, but then turn a corner and walk into a cute, old-fashioned rustic village. 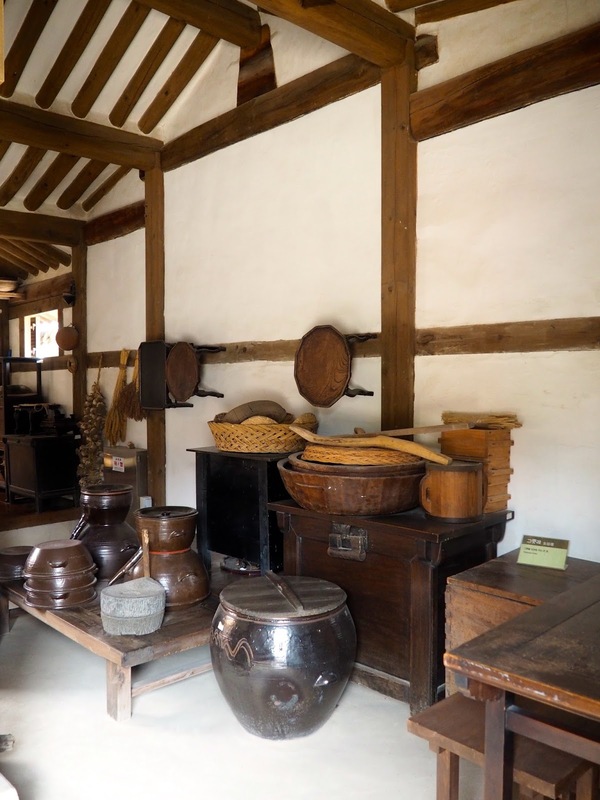 The village is made of five traditional hanok houses, replicas of places people lived, from various social classes, during the Joseon Dynasty. It was interesting to see the elements of Korean style architecture that are present both in these houses, and the royal palaces, and the elements that exist only in the wealthier buildings. The village was especially busy while I was there, since it was Chuseok, and there were many events taking place. Many of the houses host cultural activities for people to try out, such as crafts, ceremonies, and a traditional tea house, as well as games in the central yard area. There's a large pavilion nearby too, where performances are held, but I couldn't really figure out what was going on when I was there, since it was all in Korean. The park around the village is nice to have a stroll through too, with a small stream running through it and several pavilions scattered throughout. As you walk up the slight hill, at the end of the park is the Millennium Time Capsule Square. On the 600th anniversary of Seoul, in 1994, 600 items were chosen to represent the city and buried here, scheduled to be opened in 2394 for the city's 1000th anniversary. The square is lowered into the ground, and the huge stone dial in the middle is inscribed with messages from representatives of cities around the world. From there, I walked back to my hotel to rest for a while, before visiting my final location for the day, N Seoul Tower. I'd been able to see it several times throughout the day, as it's pretty hard to miss, being the highest point in the city. The tower itself is only 236m, but it's located on top of Mt. Namsan, which adds another 243m to its height. I waited until the evening to visit, to see the city lights at night. My hotel was close to the cable car station, so I'd planned to take that up the mountain, but when I got there the queue was so long. The bus is another option to get up, but I didn't know where the closest stop was, so I opted to walk up instead. It's mostly stairs to get up, and is clearly marked, so I joined the dozens of other people doing the same thing. It only took 20-30 minutes to reach the top, and while it's pretty tiring, it's certainly not the hardest hike I've done (I used to hike Victoria Peak, which is definitely higher). From the top, I then had to wait another hour and a half to go up the tower... thankfully they have a standby system, where you wait for your number to appear on a screen, so rather than standing in line that whole time, you can use it to look around the rest of the mountaintop. There's a platform with good views over the city, which is completely weighed down by hundreds of love locks. There's a pavilion that's lit up, and an archway of lights with the city in the background (lots of couples taking photos under that one). And of course there's several shops and restaurants to peruse. When my number eventually came up, I then had to wait in the line for the elevator, but thankfully it only took 10 minutes or so, before we were whisked up to the top of the tower. Sadly, I was pretty underwhelmed by the view, largely because it's difficult to actually see it with the bright lights in the observation deck creating so much reflection on the glass. I could see the city lights past the reflections a bit, but it was just a mass of lights, and I didn't know what anything was - when you've spent a year living with the Hong Kong skyline, this just didn't compare. I liked the signs that told you which cities around the world you were looking in the direction of, and how far away they are, but overall, I didn't think it was worth the long wait. The views walking back down the mountain were probably better, without the glass and reflection! And then it was time for bed! I stayed two nights in Seoul, but only one full day there, as the next morning I left again for the last stop on my trip. I will definitely be back to Seoul again in the future, as there's plenty still to see, but I felt like I made the most of the time I was there for. I focussed on cultural tourist stuff, and yes there are more of those to see, but now that I've ticked off the main ones, I'll be doing other stuff on my next trips there. Until next time Seoul! If you're interested in visiting some of these places in Seoul, you may like to check out Trazy Crew's Korean Palace Tour, or their Namsan Park & N Seoul Tower Evening Hiking Tour. 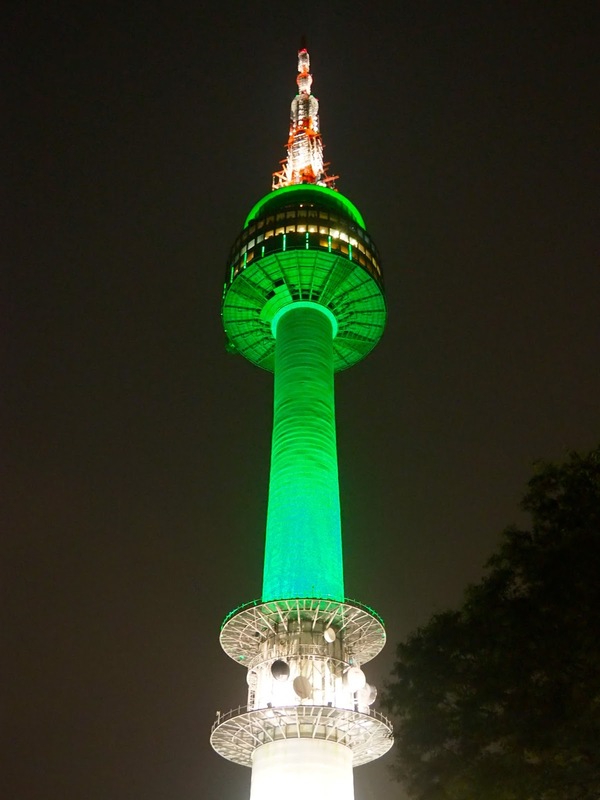 I didn't do these myself, but I am an affiliate for them - they have loads of other Seoul tours and activities available too!